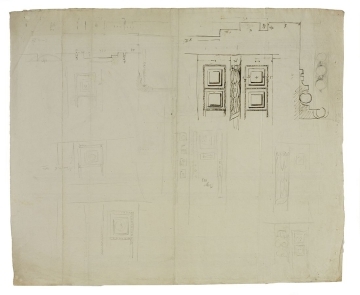 Drawing 33 is not dated and the inscription queries whether it belongs to the Consols Transfer Office, however it is included with drawings 28, 30, 34, 39, 41-42 and 45 (located together in drawer 11. Set 1. 17-24) as a set of decorative details for the Transfer Office. 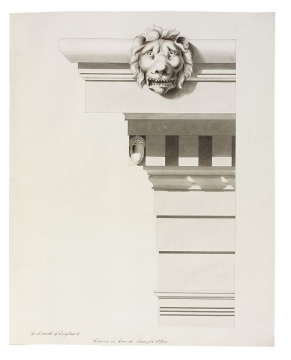 In the executed building the piers had a full entablature with complete tri-fascia architrave and dentilled cornice. The lion masks and acorn motifs conventionally connoted strength and stability. 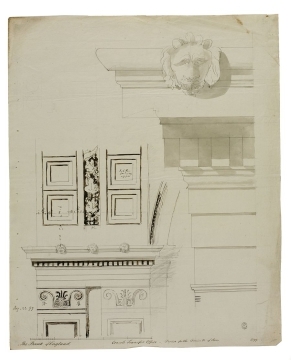 The lion masks were executed along the cornice and the acorn motif was realised in the oak leaf moulding of the trunk arches. 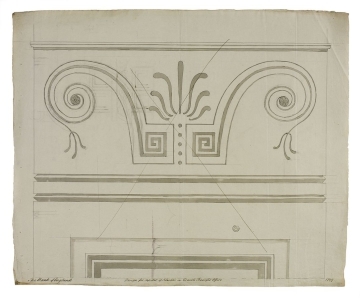 The incised capital with volutes, Greek key fret and anthemion was not executed, as indicated by the cancellation cross drawn over drawing 28, although the design does appear in the later presentation drawing 74. 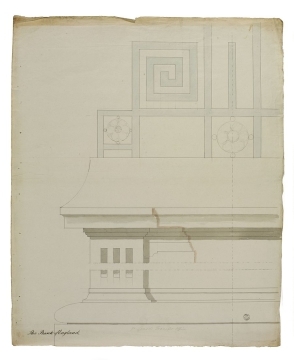 Instead a sunken panel with Greek key fret was realised on the capitals of the pilasters. In the executed hall the soffit of the groin arches was decorated with panels incised with four lines intermittently broken by rosettes within sunken square panels. 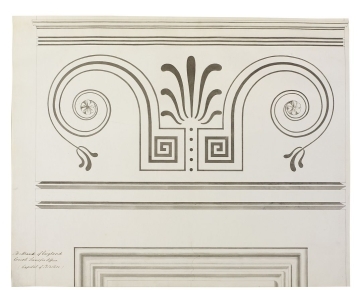 These large-scale drawings of decorative details conveyed Soane's intentions to plasterers executing the designs. 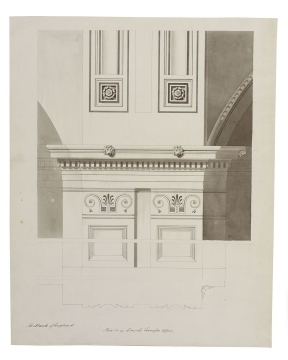 Soane would often sketch a design, as seen in the preliminary drawing 30, which a pupil would then re-draw as a finished design, as seen in drawings 31-32. 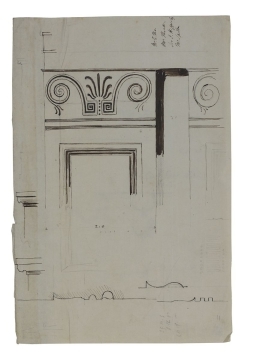 Drawing 34 appears to be in George Dance's hand, showing an elaboration of a design he had previously used at the library of Lansdowne House, London (c.1788-94). The names indicated are for craftsmen that both Dance and Soane employed: Mr Thomas was a plasterer who worked on two of Dance's jobs - Coleorton, April 1806 and at Stratton Park; Sir John Hippisley, Bt., (1747-1825); and Spiller may refer to Robert Spiller (fl. 1794-1827) mason and carver.